For the last year and a half, I’ve been fortunate enough to write the Uncork Life blog for Wine Chateau. During that time, readers have had the chance to delve into the world of wine, with news, opinions, reviews, and the occasional shot of spirits coverage. Starting today, however, I will re-focus my efforts on a brand new blog, The Food, Drink & Travel Report. My relationship with Wine Chateau is still intact in other regards, but The Report will be my own. And while readers can absolutely expect the same high level of reporting as they did at Uncork Life, the coverage at The Report will be expanded to include spirits and beer, travel, commentary on new food and beverage books and films, and reviews of restaurants around the country and around the world (contingent on my travel schedule, of course). Typically, this blog focuses on issues that directly impact the wider wine-drinking public: Important developments and news items, big-picture trends, items of interest for specific regions, tasting notes, and more. But today, I’m breaking with what we normally deal with to cover a news item that, really, only impacts those of us who live in Pennsylvania (I’m based in Philadelphia): The Pennsylvania Liquor Control Board. Anyway, so much for background. 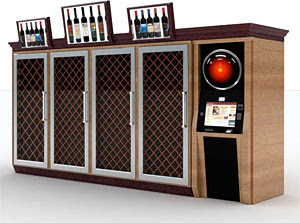 As you might have heard, last year the PLCB rolled out automated wine kiosks that would facilitate sales of wine in grocery stores, which is otherwise not permitted in our fair commonwealth. And though this may sound like a reasonable step forward in automated sales, it proved, in fact, to be a terrifying, not-even-vaguely Orwellian exercise in Big Brotherness. As this link from WGAL Channel 8 in Scranton shows, purchasing wine involves inserting your ID, having your image checked against the photo by some nameless, faceless drone on the other end, and then blowing into a breathalyzer to ensure you’re not drunk. If you pass all these tests, you’ll have the privilege of buying a (likely overpriced) bottle of uninspired wine from the state’s oh-so-esteemed selection. Well now, after constant technical glitches and mounting customer frustration, Wegman’s, the high-end supermarket, has recently asked the PLCB to remove all such kiosks from their PA stores. As WGAL reported late last week, Wegman’s sent a letter “to the Pennsylvania Liquor Control Board...The letter states that kiosk sales have been lower than expected, that the machines have not met expectations, have had a ‘high rate of operational issues and malfunctions’ and have actually been detrimental to stores. As a Pennsylvanian, as a believer in free enterprise, and as someone who loves wine, I can’t help but smile at this development: It’s yet another blow to one of the most antiquated, ridiculous government bodies in the country, and highlights yet again how absurd and out of touch its leaders are to even have gone down this crazy kiosk road. Anytime I hear of another PLCB failure, I’m reminded of a wonderful German word: Schadenfreude. It means the taking of pleasure in another’s misfortune or suffering. And having been forced to suffer at the hands of the PLCB’s crazy rules and regulations for so long, anything that highlights their ineptitude beings me enormous personal and professional pleasure. I’ll gladly raise a glass to this latest chink in the PLCB’s armor...just not one poured from a bottle that’s been purchased at a malfunctioning kiosk. I spent this past week, as I mentioned in my blog post the other day, at the bi-annual Wine Summit, sponsored by the remarkable Austrian Wine Marketing Board. The specific leg of the excursion I was on focused on Burgenland and Carnuntum and, as such, leaned heavily on the excellent Zweigelt and Blaufränkisch they produce. The trip started in Vienna, which is actually home to one of the world’s best wine regions located within a major city’s boundaries. (The photo above, in fact, is taken from the Rotes Haus, where our first night’s festivities began. You can see the city itself in the background, behind the vines.) After that, we headed south to Carnuntum, where we focused on Austria’s famously spicy Zweigelt, and then to the huge Lake Neusiedl, which does so much to moderate the temperature of the surrounding areas. West of Lake Neusiedl (or locally, Neusiedlersee), we tasted in what proved to be one of my favorite spots on the trip--Leithaberg DAC, whose fresh, food-friendly Weißburgunder (Pinot Blanc) and crisp Blaufränkisch were some of my top wines throughout. These are bottlings that sing with a bright minerality that screams out for food--just my style. More wines followed in the remaining time on the trip, including focused tastings of wines from Mittelburgenland DAC and Eisenberg DAC, both of which demonstrated decidedly different aspects of Austrian wine. This country, like all of the best in the wine world, possesses a wide enough range of terroirs and winemaking talent to be able to call itself home to a huge range of styles and expressions. That diversity is what makes a national wine culture exciting, and Austria, as I’ve said for years, is among my favorite in the world. We ended the trip back where it started--in Vienna--with a closing-night party at the famous Prater, with live music and more food and wine than a group twice this size could have consumed. The night was highlighted by crowd-rousing musical performances by the AWMB’s Managing Director Willi Klinger and wine writer and budding wine-travel impresario Ben Weinberg. Between Willi’s “Maxwell’s Silver Hammer,” Ben’s “Stormy Monday,” and the glass of Grüner Veltliner Ice Wine I sipped afterward, I cannot think of a better way to have ended this spectacular experience. Over the coming weeks, I’ll be posting tasting notes and impressions of specific wines and regions. Keep your eyes open for them. In the meantime, start stocking up on the great wines of Austria.